KROHNE’s OPTISWIRL 4200 vortex flowmeter can be used for internal monitoring of energy flows for saturated and superheated steam or hot water, as well as heat-metering applications. It is also an optimal choice for steam-boiler monitoring, burner consumption measurement or compressed air-network monitoring, including free air delivery (FAD) applications. The all-in-one solution features integrated pressure and temperature compensation and can perform gross heat calculations for steam and net heat calculations for steam and condensate (hot water). This unit is available in a remote version, equipped with a field housing converter (with a connection cable up to 164 feet [50 meters]). 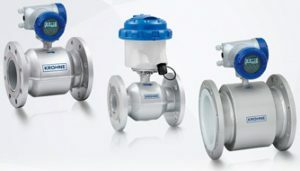 Temperature and pressure compensation options are also available, which enable calculation of standard flow volume under fluctuating pressures and temperatures.